It might not be the Mecca of Boxing anymore, but Madison Square Garden remains a special place to watch a big fight. Remarkably, the now three year old glossy renovation didn’t completely strip the building of the soul that embraced names like Ali, Frazier, and Duran. Names like Louis, Marciano, Robinson, LaMotta, and Dempsey took the stage at previous versions of the Garden before it moved to its current site at 34th street in Manhattan. Some would say those were the days when New York was really ‘New York’; but that discussion can be shelved for another day. Most of the fights I attended in my 20’s took place at the Garden before it was renovated. I lived in Long Island City, Queens at the time; and it was an quick trip aboard the seven train on fight night to meet some of my childhood friends for a night of liver degrading mayhem. I remember the electric atmosphere as we sat in the upper deck in 2007 when WBA welterweight champion Miguel Cotto took on Zab Judah on the eve of the Puerto Rican day parade. Before the main event was set to begin we heard a commotion in the rows behind us. Being as we were at the top of the arena we were sure some kind of fracas was about to ensue. The disturbance turned out to be fans gawking at a man walking down the steps of the upper deck with each of his arms wrapped around the waist of a picturesque female. Much to our amusement the gentleman was the late boxing icon Hector Macho Camacho. Our inebriation made us wonder in amazement why the hell he was in the upper deck to begin with. Surely, Camacho should be ringside shouldn’t he? Five months later in November of 2007 Cotto would defend his WBA title again against Shane Mosley. For whatever reason the fight was far from a sellout which enabled my cohorts and I to move down to almost floor level seating. Watching a high level battle like that from so close was something I have never forgotten. By the time the fight was over our inebriation and exhilaration had reached peak levels - and we rode the high of a great fight through the halls of the Garden towards a night in Manhattan. As we bounded past the post fight bathroom lines, I saw someone out of the corner of my eye who seemed to trigger a feeling of recognition. After a double take, I realized it was (at the time) UFC Light Heavyweight Champion Quinton ‘Rampage’ Jackson. I began to shout ‘Rampage! Rampage! Rampage!’ as I drunkenly swerved towards him. Even in my haze I quickly saw that he was not amused, and proceeded to swerve back in the other direction before he had time to make good on the disdain his face projected. My friend trailing behind me didn’t seem discouraged by Jackson’s hateful gaze as he proceeded to grab the UFC champion’s hand. He then tried to pull Jackson’s hand towards his face as he screamed in a grizzly voice, ‘I want to see the hand that knocked out Chuck Liddell!’. It was at this point that the thought actually crossed my mind that I was going to die a quick death honoring the brother code by defending my friend from an attack by one of the baddest men on the planet. However, Jackson seemed more shocked than anything and simply yanked his hand away as we scurried towards the Garden exit like mice evading a momentarily bewildered predator. Fight nights at the pre-renovated Garden were crowded, hectic, and hangover inducing. But they were also fun. There weren’t security guards guarding every section or surveillance cameras in every stairwell. There wasn’t a bad seat in the house; the upper deck had clear sight lines to the action in the ring. Yet under the stewardship of Cablevision scion Jim ‘Fuehrer’ Dolan a corporate upgrade to the Garden was probably inevitable. The late, great columnist Jimmy Breslin once described former New York City mayor Rudy Giuliani as a ‘short man in search of a balcony’. Jim Dolan has always seemed like a short man in search of an authentic compliment. Yet despite his shortcomings, Dolan does deserve credit for engineering a facelift that left the subject recognizable to those familiar with its previous visage. The Garden still feels like the Garden. Ten years ago it was Miguel Cotto who reigned over the boxing universe at the Garden. As of today it is probably IBO, WBC, IBF, and WBA middleweight champion Gennady Golovkin. Golovkin has certainly put the ‘world’ in world champion; having defended his titles from Los Angeles to Monte Carlo. Yet Golovkin fights in New York have become a special event. And as soon as the March 18th fight between Golovkin and WBA ‘regular’ middleweight champion Daniel Jacobs was announced I knew I would have to attend. Privileged enough to take photographs for UCN (and far removed from my 20’s) this trip to the Garden would not be like those I took in the 2000’s. But I knew it would still be filled with good times, good people, and hopefully a great fight to top it off. With the Friday before the Golovkin fight being St. Patrick’s day and the pro debut of Irish fighter Michael Conlan (at the smaller Theatre at the Garden); I was expecting the atmosphere in the area around the Garden to be a hectic one. This proved to be an accurate prediction. As the epicenter of all things boxing during a Garden fight weekend; the Stewart Hotel on 7th avenue was buzzing with activity. Adorned with fight advertising, the expansive lobby hosted a table of Gennady Golovkin apparel toward its rear. Undercard fighters and their teams could be seen coming and going or milling about. Former light heavyweight champion Sergey Kovalev dined in the hotel restaurant, while the father of now former WBC super flyweight champion Roman Gonzalez held court at the hotel bar. K2 Promotions chief Tom Loeffler came and went, while boxing scribes captured on (an off) the record quotes from various figures in the sport. About a five minute walk from the Stewart Hotel is Brother Jimmy’s BBQ and bar. Located adjacent to the Garden it’s proved to be an apt landing spot for those getting suitably prepared for a night of fights across the way. At Jimmy’s before a fight one will always see old friends and sometimes make new ones. During my time over the weekend at Jimmy’s I discovered that fighter Sam ‘The Vanilla Gorilla’ Crossed had grown a beard not worthy of mortal men. I spent time with Larry from Wisconsin which could be the subject of its own book, let alone column. I met Tim from Iowa who eventually told me one of the best fight night stories I’ve heard in a long, long time. I learned about all things Philadelphia from hip hop and boxing aficionado Vinnie Paz, did business with the honorable Jim Boone of KO tickets, and chatted with ‘Beef’ from Philadelphia who remains a gentleman of the highest order. I also met UCN’s Rian Scalia for the first time. Now with Rian being well known for his encyclopedic knowledge of up and coming boxing talent, I was curious as to how he went about his business. I asked Rian how he kept track of all his knowledge, and he simply pointed to his head slyly. Convinced that he worked in the Canadian oil sands because of all the time off he seemed to have I confronted him with my suspicions. He promptly denied any association with the oil sands and said he was in ‘sales’. He then told me he was thinking about going to Thailand to become a fighter full time. This convinced me to refrain from probing his occupation further out of fears he could kick my legs out from under me (despite my height advantage). All joking aside; Rian is a good man. Leaving Brother Jimmy’s to enter the Garden on fight night is always bitter sweet. You will no doubt not see some of the people you’ve left for a long while; yet the time for the event you’ve been waiting months for has finally come. It was rainy, but not too cold as I made my way to the press entrance just across 31st street at around 7:30PM on Saturday. Sergey Kovalev was taking photos with some fans just outside the door as his manager Egis Klimas waited patiently. I’ve wanted to meet Kovalev and Klimas for some time but they headed towards a different entrance before I could think of a suitable approach. I made my way inside and headed up the many escalators toward the thin air of the upper deck press section. Much has been made of the press seating for the Golovkin-Jacobs fight. Many reporters covering the fight were relegated to the upper deck. Whether the reason for this was the sheer number of people covering the fight, the desires of the promoters for more floor seating, or an extension of Garden media policy; I do not know. Being at the bottom of the totem pole it didn’t really bother me; I was just happy to be there. Yet the obstructed post-renovation views from the upper deck didn’t exactly lend themselves to great photographs. Realizing this, someone in authority said that photographers with upper deck assignments were free to move to a lower press section with clearer views. Needless to say, this opportunity was taken advantage of. Amid the journalistic musical chairs, I found a suitable spot to take in the action with a clear sight line. Former middleweight champion Andy Lee was fighting in a bout which would prove to be uneventful. The crowd let their dismay at the lack of action be known periodically. Former super flyweight champion Carlos Cuadras would enter the ring in a later bout that was primarily supposed to set up a rematch with pound for pound king Roman Gonzalez in the future. 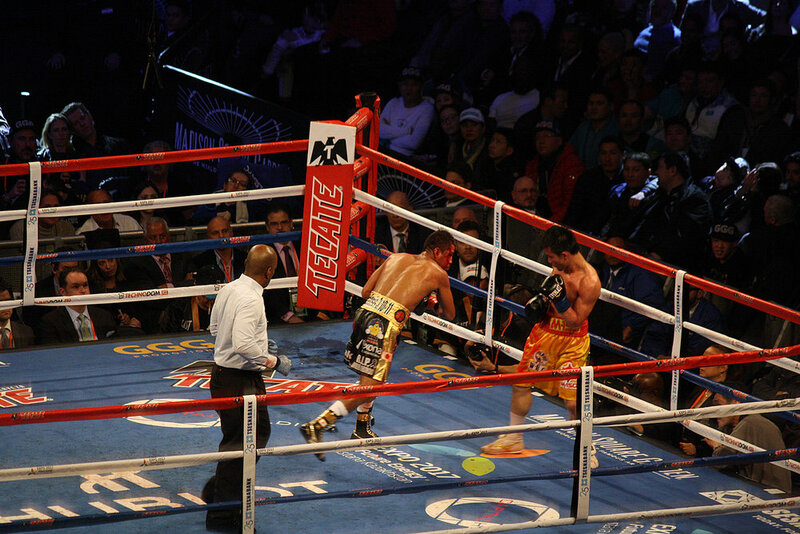 Cuadras’ bout proved to be uneventful as well, and the Garden crowd was forced to voice their dismay again. 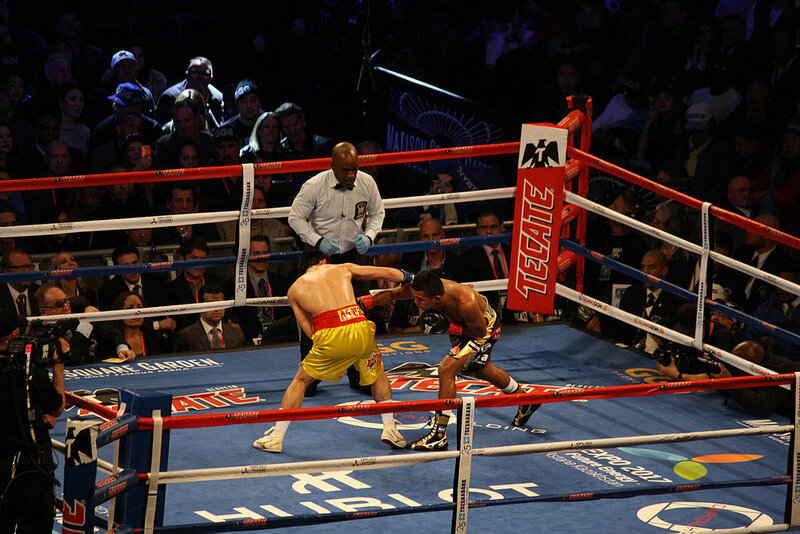 Gonzalez would enter the ring carrying the WBC super flyweight title in the last bout before the main event. His opponent was the tough Thai fighter Wisaksil Wangek. Gonzalez would suffer the first loss in his long career via a decision that many (including I) thought was incorrect. Irregardless, at this weight class and age Roman Gonzalez seems to fight like he’s swimming upstream against a hard current - everything is a hard slog. One has to wonder how many more trials he can go through. At various points during the undercard bouts the two main characters featured in the story of the night would be shown on the Garden jumbo screen above the ring. Video of Gennady Golovkin and Daniel Jacobs going through their last minute preparations before battle drew sizable reactions from the crowd. 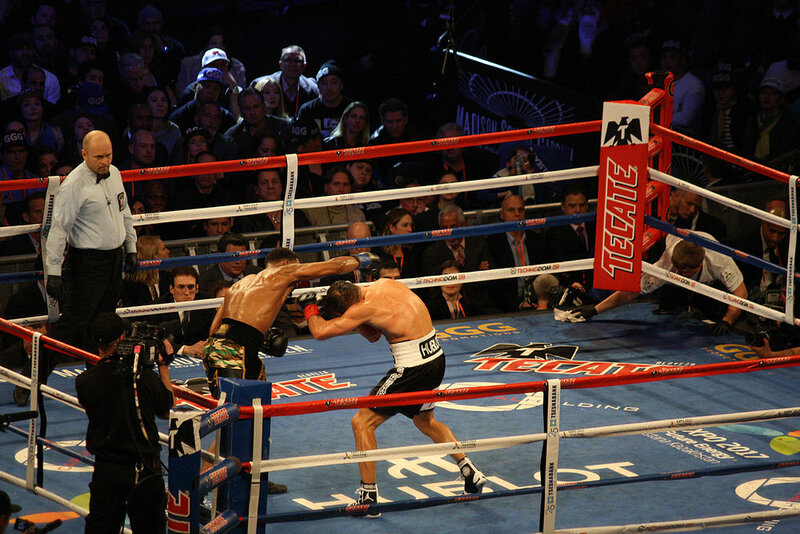 The crowd support between the two seemed to be around 70-30 or 60-40 in favor of Golovkin. The flag belonging to Golovkin’s home country of Kazakhstan could be seen peppered throughout the packed arena. It seemed rather remarkable that a kid from Brownsville, Brooklyn (Jacobs) could fight for the middleweight championship of the world in New York City and have less fan support than a guy from Kazakhstan whose third or fourth language was English. Comparing the history of how each fighter had been promoted over the years would probably yield valuable lessons of what works and what doesn’t when promoting a fighter. As the time finally came for the main event, most of the press seat jostling had settled down and all eyes were focused on the ring. Daniel Jacobs entered the ring first, bouncing around with excitement and feeding off of his musical accompaniment. 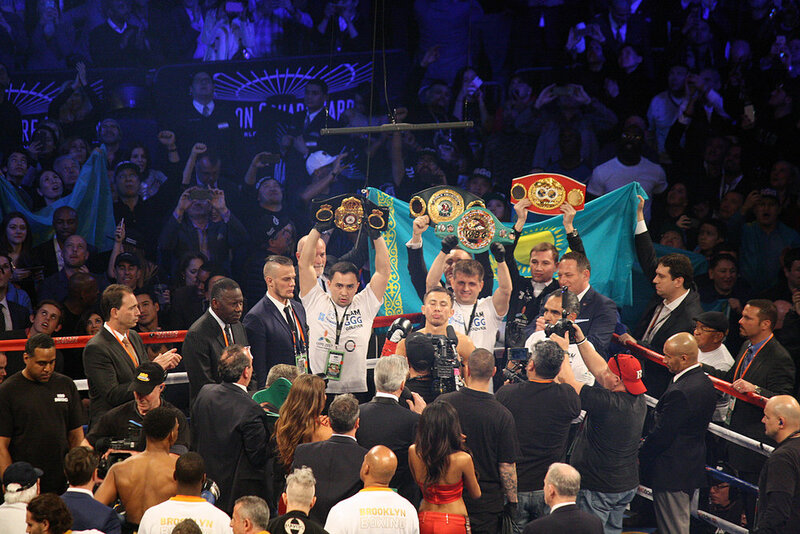 As the champion, Golovkin came second. Golovkin’s entranced kicked off with a nod to the Flo Rida song ‘Welcome To My House’ - as the champ was apparently claiming his turf. A neon lighted drum core followed and banged away until ‘Seven Nation Army’ by The White Stripes blasted from the Garden soundsystem. Golovkin proceeded to make his regal entrance as he moved towards the ring in his trademark blue and gold robe. His team followed close behind holding Golovkin's belt’s high almost as medieval armies held their banners before engaging in combat. Watching a fight through a zoom lens is a bit different than being a usual spectator. For you are trying to capture the action as well as enjoy and observe it. The following are my observations about what transpired during what turned out to be a close fight. As of this writing I have not watched a video replay. 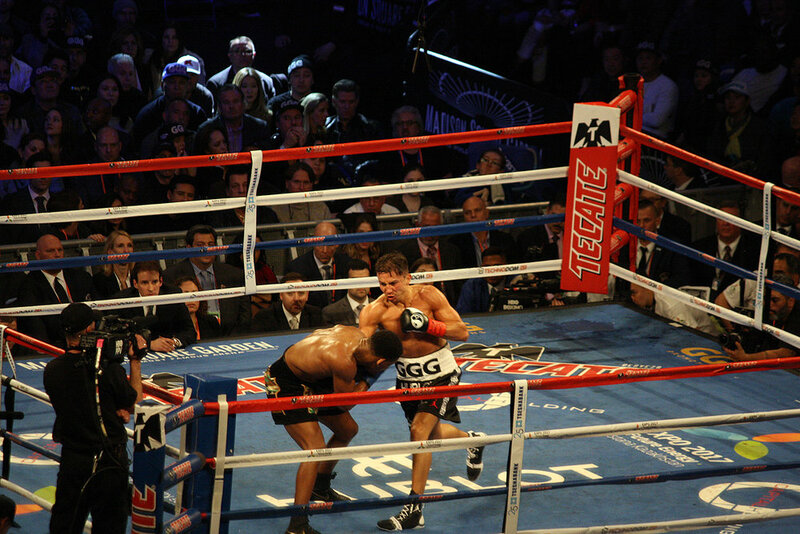 The first couple of rounds were a bit uneventful which seemed odd from Golovkin's perspective. Maybe it was the size of Jacobs that gave him pause; but I thought from the opening bell Golovkin would look to chop Jacobs down by going after the bigger man’s body. Golovkin was still his usual come forward self it seemed; but Jacobs was proving harder to corner than Golovkin's past opponents. 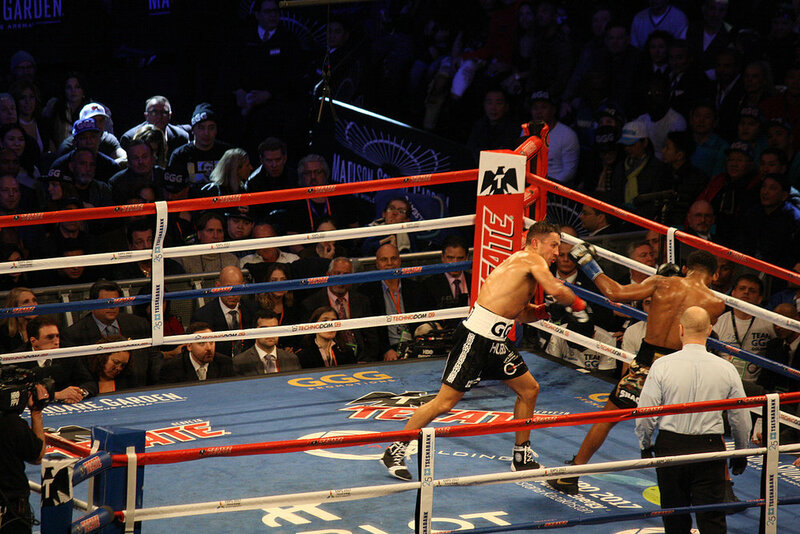 Golovkin’s jab was ever powerful, and you could see it affecting Jacobs. When Jacobs was sent to the canvas early on in the fight I of course thought that the end was near. For when Golovkin smells blood he usually goes in for the kill. 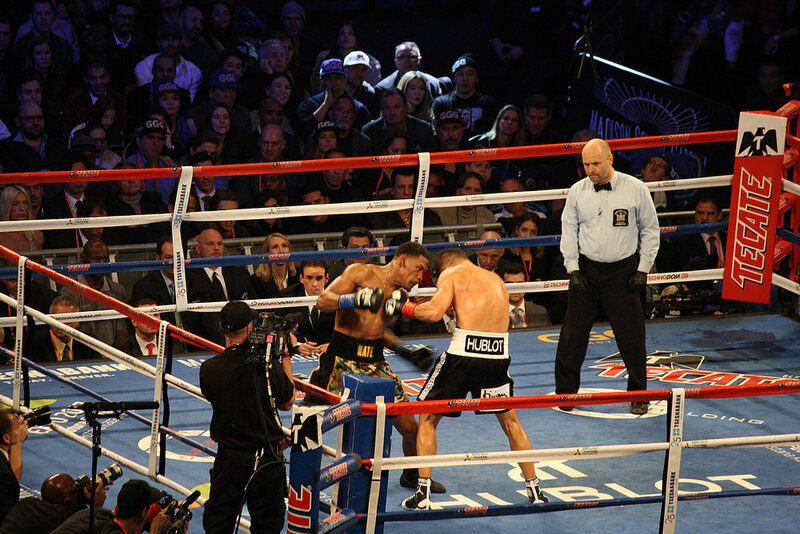 Yet after surviving the knockdown and the ensuing rounds Jacobs seemed to gain confidence. His size and movement were indeed paying the dividends that many leading up to the fight thought they would. As the crowd realized that Jacobs was indeed turning the bout into a real fight for Golovkin you could feel the energy in the arena change. The collective energy started to take on the feeling that one gets when a heavily favored sports team has a chance to lose to a live underdog. 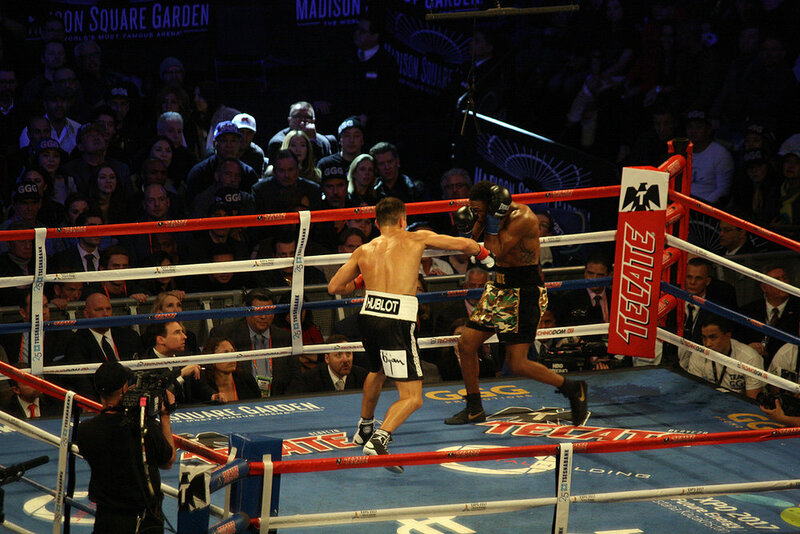 Jacobs fans in the crowd began to chant ‘Let’s go Jacobs!’. While Golovkin fans would answer with chants of ‘GGG, GGG, GGG’. As Jacobs landed punches at the end of a round he screamed with the intensity of someone finally standing up to a bully or tormentor. Throughout the back and forth action I never got the sense that Jacobs had pulled ahead. He never hurt Golovkin; and it seemed to me that he got stung by Golovkin a couple of times at least. I believe it was former middleweight contender and Golovkin victim Martin Murray who said that in order to beat Golovkin you have to meet him in the middle of the ring and keep him from walking forward. This is easier said than done of course, and Daniel Jacobs was unable to do it. However, I thought that Jacobs almost pulled off a different strategy that was better suited to his skill set. If Jacobs was able to move, engage, and attack in a manner similar to Muhammad Ali or Sugar Ray Leonard I could have seen him pulling the upset. Again, this is easier said than done. Ali and Leonard are all time greats because few (if any) could do what they did. As the fight came to an end Jacobs fell to his knees and clung to the top rope near his corner as if he had just conquered the impossible. I felt Golovkin had won a close fight, though I also felt some suspense was deserved going into the decision. As Michael Buffer announced the decision, the crowd reacted according to its allegiances. Golovkin looked kind of relieved while Jacobs wore a mug of disappointment. 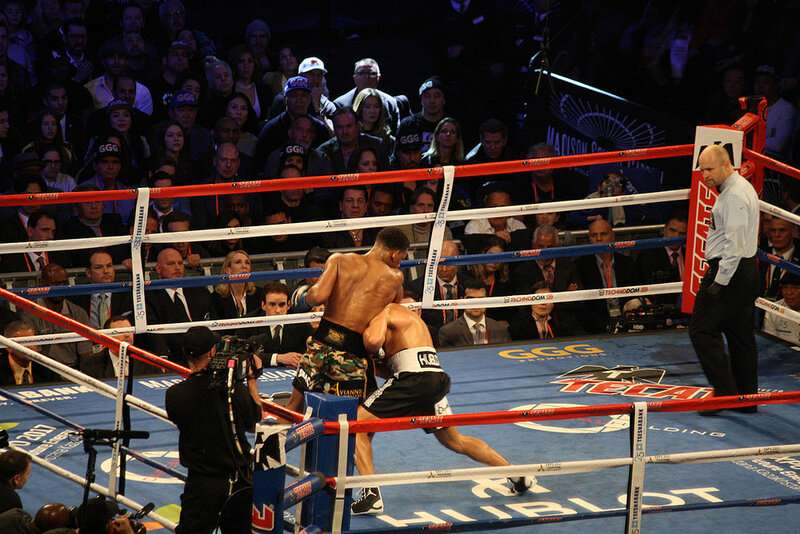 In his post fight interview Jacobs implored that the crowd knew he had won and he was the victim of a bad decision. I wondered what would have happened had Jacobs fought a more active schedule against tougher competition over the past two years. Maybe he would be the one holding the belts now and not Golovkin. For the whole fight it just seemed like Jacobs was learning to swim in the deep end after having just been thrown in the pool. Golovkin still owns the Garden for now. As I wrote in ‘The Example’ a while back Golovkin started from zero and climbed to the apex of the sport. Becoming a draw at the Garden is no small achievement. Yet father time will call Golovkin’s name one day and the Garden mantle will be open for another fighter to claim it. As I packed up my gear and headed towards the exits I was greeted by a familiar feeling of New York post fight exuberance. The Garden had just notched another mark in its boxing history and I was grateful to attend. For as those many years ago when Miguel Cotto was king of the place; fight nights at the Garden are still fun as all hell. Here’s hoping Jacobs fights twice more this year against tough opponents and Golovkin takes all the middleweight belts into next year. A rematch at the Garden between a peaking Jacobs and a fully unified Golovkin would be fun wouldn’t it? Yes, I think it would be very fun indeed.